Archbishop Duke appoints Father Albert Eisenring as the first pastor of a new parish in the Lynn Valley area of North Vancouver. Land for the new parish had been acquired several years earlier. Father Eisenring takes up residence in the smaller of the two existing, rundown houses on the parish property and recommends that the new parish be named in honor of Saint Stephen, the first martyr. 1963, November: The first Mass in the new parish is celebrated on November 17 at the Lynn Valley Community Centre on Frederick Road. Over 400 people were in attendance. 1964, March: The first meeting of the Saint Stephen’s chapter of the Catholic Women’s League is held. 1964, July: Renovations to the second house on the property are completed, and it becomes the parish rectory. This small house continued to serve as the parish rectory for about twenty more years. 1964, September: Construction begins on a new building that was intended to serve eventually as the parish hall and, in the interim, as a more suitable venue for Mass. This is the present church. 1964, December: The first Mass is celebrated in the new church/hall on Christmas Eve. 1965, March: Archbishop Johnson blesses the new church on March 14. 1969, August: Father Eisenring leaves Saint Stephen’s to pursue graduate studies in psychology at the University of Detroit. Father David Monroe is named parish administrator. 1970, July: Father John Swinkels is appointed the second pastor of Saint Stephen’s. 1971, March: Pierre Elliott Trudeau, then the prime minister of Canada, and Margaret Sinclair are married at Saint Stephen’s. 1971, September: Father Lawrence Sabatini, a member of the Congregation of the Missionaries of St. Charles (Scalabrinarians), is appointed third pastor of Saint Stephen’s. 1972–1973: Part of the parish land is sold for private housing to raise funds for the parish. 1974: Construction of the parish hall is completed. 1978, July: Father Albert Corradin, also a Scalabrinarian, is appointed fourth pastor of Saint Stephen’s. Father Sabatini is appointed Auxiliary Bishop of Vancouver. 1978, August: The parish debt is eliminated. 1980: The first Extraordinary Ministers of the Eucharist are commissioned. 1982, July: Father William Kilty is appointed fifth pastor of Saint Stephen’s. 1992, July: Father William Mendenhall is appointed sixth pastor of Saint Stephen’s. 1993, July: Father Lawrence Holland is appointed seventh pastor of Saint Stephen’s. 1994: The Seniors Outreach Program begins its work in the parish. 1995: The Seeds program for 3- to 5-year olds starts up. 2000, Spring: First steps taken to offer an ALPHA Course at Saint Stephen’s. 2000, June: The newly established Social Committee organizes its first event for the parish, a square dance. 2003, July: Father Peter Chiang is appointed eighth pastor of Saint Stephen’s. 2008, June: Father Frank A. Landry succeeds Fr. Chiang as ninth pastor of Saint Stephen’s. 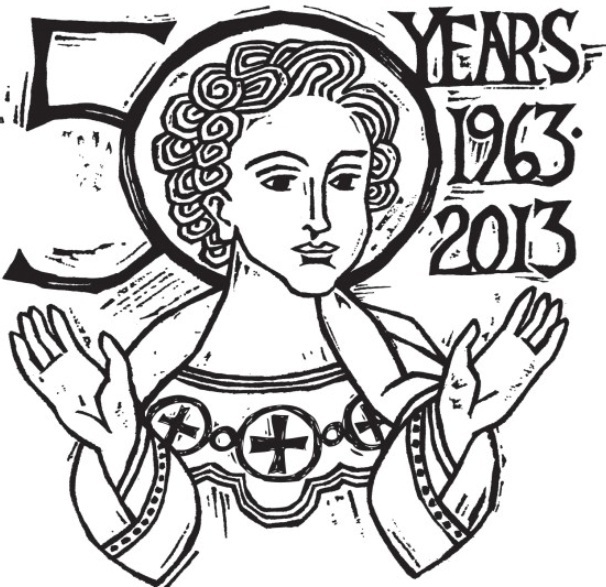 2013, October: St. Stephens Parish celebrates its 50th anniversary of serving the Catholic community in North Vancouver. 2015, July: Father Mark Schwab succeeds Fr. Frank Landry as tenth pastor of Saint Stephen’s.